Fanny Price, the protagonist of Mansfield Park, is not much of a heroine. She is almost always in an environment where she has no direct or indirect influence on events. She suffers, she endures, she is pathetic. Her greatest moment of weakness is allowing herself to be drafted into the Bertrams' play. Her greatest triumph is declining Henry Crawford's marriage proposal, on the grounds that he is immoral. All of this happens before the last third of the novel, when Fanny returns home to her poor, vulgar Portsmouth family. The change of setting allows us to see how deeply Fanny has changed. She may still be passive, but is no longer pathetic. There has been enormous inner growth of character. If you feel too sorry for Fanny, you can be her friend. Here is her Myspace page. Be warned, it plays music. Anyway, I like Fanny well enough, despite her drinking problem ("Never had Fanny more wanted a cordial.” Vol. III Ch. 15). But I don't read Mansfield Park for Fanny. "It was only the spring twelvemonth before Mr. Norris's death, that we put in the apricot against the stable wall, which is now grown such a noble tree, and getting to such perfection, sir," addressing herself then to Dr. Grant. "The tree thrives well beyond a doubt, madam," replied Dr. Grant. "The soil is good: and I never pass it without regretting, that the fruit should be so little worth the trouble of gathering." "Sir it is a moor park, we bought it as a moor park, and it cost us - that is, it was a present from Sir Thomas, but I saw the bill, and I know it cost seven shillings, and was charged as a moor park." "You were imposed on, ma'am," replied Dr. Grant; "these potatoes have as much the flavor of a moor park apricot, as the fruit from that tree. It is an insipid fruit at the best; but a good apricot is eatable, which none from my garden are." Vol I Ch. 6. There is nothing much like this in Austen's earlier novels. Descriptive details or physical objects of any sort are extremely rare. When they do occur, they are often of a conventional nature. See Elizabeth's visit to Darcy's estate - it could be cribbed from a guidebook. After seeing William to the last moment, Fanny walked back to the breakfast-room with a very saddened heart to grieve over the melancholy change; and there her uncle kindly left her to cry in peace, conceiving perhaps that the deserted chair of each young man might exercise her tender enthusiasm, and that the remaining cold pork bones and mustard in William's plate, might but divide her feelings with the broken egg-shells in Mr. Crawford's. She sat and cried con amore as her uncle intended, but it was con amore fraternal and no other. William was gone, and she now felt as if she had wasted half his visit in idle cares and selfish solicitudes unconnected with him. Vol. II, Ch. 11. These cold pork bones and flavorless apricots are to me very high instances of Austen's art - they supply artful detail to the scene, but also fill out characters in ways that make simple description seem very clumsy. Mansfield Park is full of this sort of thing - the entire episode by the ha-ha is another example, where the exact locations of the chracters are crucial to really understanding the scene. In Sense and Sensibility, people are mostly just in rooms together. There is more literature in Mansfield Park than in Austen's other novels. The play is an actual play, by Elizabeth Inchbald. Fanny quotes Scott and Sterne and mentions William Cowper. Just more of Austen filling in the scene. When do the Bennets or Dashwoods ever mention what they read? Maybe the parody novels - Sense and Sensibility and Northanger Abbey - have more of this stuff than I recognize. I think Austen's artistry makes a huge leap in the decade gap bewteen the writing of the first three novels and the last three. Maybe not her art of creating characters - she never recreates Elizabeth Bennet - but her prose is richer and she's becomes more observant. The next time I read Pride and Prejudice or Sense and Sensibility, I'll see if I can prove myself wrong. Elizabeth Bennet, the heroine of Pride and Prejudice, is something along the lines of the most likable fictional person in history. * This is the source of Austen's unusual popularity, this is what all of her chick lit followers want to recreate. Elizabeth's older sister Jane is prettier. ** Her bookish younger sister Mary is smarter, though a fool ("Mary wished to say something very sensible, but knew not how"). Elizabeth is witty, generous, kind, observant - all the sorts of things we wish we were. And if we don't identify ourselves with her, we know she'd be a great friend. I hope this does not sound like some sortof mockery. It's not. Lots of writers - most great writers - create characters just as full and alive. Austen's own characters are among them. But how many of her readers love Austen for pathetic Fanny in Mansfield Park, or prickly Emma, or even sensible, self-sacrificing Anne Elliot? I like Elizabeth more, myself. "Most likable fictional person" - that's my own opinion, not an attempt to describe the opinion of others. My problem here is that I either do not understand or do not respect her achievement, as large as it is. Compare Elizabeth to her predecessors, to Burney's Evelina or Richardson's Clarissa Harlowe, or Austens own Dashwoods. Something new is going on here, a real advance in fictional characterization. Or compare Austen to Scott or (early) Dickens, who can toss off brilliant minor characters by the fistful, but have enormous trouble creating interesting central characters. Anyway, I don't fiction read to meet new friends. Tomorrow I will try to describe what I do look for, using Mansfield Park, which I think is a much greater artistic work than Pride and Prejudice. But it's much less loved, and doesn't have the likes of Elizabeth Bennet. I'm not sure any other novel does. * Other candidates are welcome, since my ignorance is vast. And anyone who finds Jo from Little Women more likable, or Effi Briest, or David Copperfield, or Oskar Matzerath, should firmly stick with that position. ** Jane is very likable, too. So is Darcy, once he overcomes his pride (or is it prejudice?). The difference is, we love Elizabeth as soon as we meet her. An anonymous commenter spurs me to undo, or at least contradict, yesterday's misAustenic rantings. English professor Paula Marantz Cohen has written three novels, two of them with Jane Austen in the title. In one respect, this is savvy marketing, bait for the Austen cult. But it is also truth in advertising. Cohen boldly steals Austen's plots, plunking them down in her own contemporary American, Jewish milieu. Because the plot is the least important part of any good novel,* this saves her a lot of time and energy. Jane Austen in Scarsdale, or Love, Death, and the SATs is the latest one. The plot is that of Persuasion, cleverly moved to Westchester County, but the interest of the book is really in the subtitle. The Anne Elliot stand-in is head guidance counsellor at a wealthy school, and much of the book is satire about the lunatic competition by students and parents to get into top colleges. None of this has any relation to Jane Austen, and it is the best thing in the book. Much Ado About Jesse Kaplan, which hangs off of Shakespeare rather than Austen, has an identical structure. There's a plot that is actually about Shakespeare sonnets - the heroine's mother begins to think that she is Shakespeare's Dark Lady - but the most fun lies in the insanity of preparing for an upper-class bat mitzvah. The caterer, the DJ, I don't remember what else. Really funny stuff. Jane Austen in Boca is unread by me at this point. This one is Pride and Prejudice amongst Florida retirees. Cohen is funny, the literary business is unobtrusive (in the Scarsdale book, anyway) but gives the story a little more juice, and the change of setting and character does not stomp on the original. Cohen understands Austen's moral setting - she updates rather than upends. I think these are the only "chick lit" novels I've ever read. Light reading should not mean the end of critical thinking. *Outrageous and certainly wrong. The thickness of the paper is obviously less important than the plot. Upon reflection, I may come up with other examples. - a series of mysteries in which the detective is Jane Austen, now in its ninth volume. Ninth! - a series of mysteries in which the detectives are Darcy and Elizabeth from Pride and Prejudice, now in its third (!) volume. - a series of romances, one for each of Darcy and Elizabeth's five daughters. Five, just like the Bennet sisters, ain't that clever. I don't know if the youngest two are complete idiots, just like the Bennet sisters. Maybe I should link to these. They're easy enough to find, though, for the morbidly curious. I understand how a mystery involving Jane Austen could be a hoot. But nine of them - nine verges on the soul-deadening. The Elizabeth & Darcy mysteries are even worse. I don't see how any of these books are really for fans of Jane Austen. They're travesties, ghastly parodies. They don't repeat or revisit the pleasures of the books, but instead mock them. There are more - Pride and Prejudice from Darcy's point of view, and various attempts at finishing Sanditon. I have a little more sympathy here. A gifted writer could potentially do something interesting here, along the line of Jean Rhys in The Wide Sargasso Sea. Sanditon in particular is a sad case. It is lovely and funny as a fragment, and would certainly have been as good as Austen's other books, so the temptation to finish it is not in and of itself a desecration. I have some doubts about the results. Somewhere here is a failure of education. The reader of a Jane Austen mystery really wants more Jane Austen, so he settles for a feeble imitation. What he ought to do is expand his reading a bit, to Gaskell or Trollope or The Heart of Midlothian. Or follow Austen back to her sources, like Ann Radcliffe, or favorites, like Richardson. ** Anyone who has been tempted by a Darcy and Elizabeth mystery should not just add Fanny Burney’s Evelina to their NetBoox queue, but should put it on the very top. I think many Austen fans, perhaps most, actually do read like this. But there's another group that does not, who don't know how to explore in their reading, how to follow one book to another. Someone failed them somewhere. Feel free to ignore everything the grump says - except do read Evelina! * The author of the Darcy and Elizabeth mysteries previously wrote Dungeons and Dragons novels. Hack, hack, hack. ** Austen's favorite book was Sir Charles Grandison. If there were a sweeps week for literature blogs, which for all I know there is, that’s when I would post about Jane Austen. When you see “the Faulkner industry” or “the Pynchon industry” or what have you, someone is making fun of academics and their monographs. But the Jane Austen industry is an actual consumer goods industry, of books, of course, and movies, and books based on books, and, as I saw recently, a board game. I don’t know of any porcelain figurines or scarves or umbrellas like Pamela and Oliver Twist inspired, but who knows and why not? Some of this drives me crazy. The movies that misunderstand the Austen’s values, moral and esthetic. The sequels and prequels and miscellaneous hackwork. More on this later as I sort my thoughts, or organize my peeves. Unless I decide I'm just being a grump and drop the whole thing. About that board game. It is basically Trivial Pursuit, with questions about either Austen’s books or Regency England. At the end the winner has “gotten married.” A lot of people dismiss Austen because they think her only subject is getting a young woman past various obstacles to a superior marriage. Many of her biggest fans love her for the same reason. Another thing to drive me crazy. This may be her only plot, but it is certainly not her only subject – pride and vanity, humility, the difficulties of communication, dependence and independence, the world around her. Not weddings, always a trivial part of the novels. Not marriage, at least not of young people. Of old fools, yes. You can read Austen's books, even love her books, without giving a damn about who marries who in the end. A reader interested in literary art will want to change "can" to "should". *Little Women? The Alice books? Huckleberry Finn? All in some sense kids’ books now. And I don’t think any of them come close to selling as many copies as P&P. Other examples are welcome. James Wood is my favorite critic working today. He has his limits - what great critic does not - but he always offers original insights. The New Yorker wisely hired him this summer. What took them so long? His latest piece is on the new War and Peace translation, a subject I will soon be sick of. Wood is typically excellent on Tolstoy's voice, a complicated subject in War and Peace due to the inset essays about the meaning and nature of history. There, Tolstoy could hardly be more obtrusive, while in the narrative sections he often comes close to vanishing. The narrative sometimes seems to contradict the essays. To which Tolstoy should the reader listen? I suppose a new reader of War and Peace should save this piece for later. Wood discusses books seriously - he assumes that you're not reading the book for the soap opera. Wood says that Tolstoy first envisioned the book as a domestic saga in the manner of Trollope, set in 1856, called All's Well That Ends Well. Great leaps of rethinking led to the final product. To understand 1856, one must understand the Decemberist conspiracy of 1825. To understand 1825, one must understand Napoleon and 1812. And so on. The puzzle is how Tolstoy put a stop to this retogression and actually wrote a novel. I'm going to try to post a version of this at the Russian Reading Challenge as well. "Colonel Boardman, the engineer of the Mill-Dam, is now here, after about a fortnight’s absence. A plain, country-squire looking man with a figure but with rather a ponderous brow; a rough complexion; a gait, and general rigidity of manner, something like a schoolmaster. He originated in a country-town, and is a self-educated man. As he walked down the gravel-walk, to day, after dinner, he took up a scythe, which one of the mowers had left in the sward, and began to mow, with quite a scientific swing. On the coming of the mower, he laid it down, perhaps a little ashamed of his amusement." The American Notebooks, Centenary edition, pp. 54-5. Hawthrone is still in Augusta, Maine. This passage would not look out of place in Turgenev or Tolstoy. Or Flaubert. Well-observed and insightful. Now if I can only find its equivalent in Hawthorne's own stories. The context, if it matters, is that Hawthorne is visiting a college friend in Augusta, Maine. Mr. Schaeffer is the friend's French roommate. In a Dickens novel, this would be typically brilliant sketch. In a Balzac novel, this would be one of the good bits. It would not be out of place in either. The temporary attempts at seriousness about his shaving are the best touch. Test question: What book did you most dislike in this course? What intellectual or characterological flaws in you does that dislike point to? This question was a regular feature on the Western Civ-equivalent final of a Columbia prof, or so I read in a classic Harpers article, "Lite Entertainment for Bored College Students", by Mark Edmundson, available here as a PDF. Great questions. Maybe I'll write more about them later. But right now, the issue is that I most dislike the stories of Nathaniel Hawthorne. I have the confidence to say that some of them are terrible - the four under the heading "Legends of the Province-House", for example. Ugh, ugh. Very much period pieces, at minimum. But there are others where the problem is with my understanding, certainly with my sympathy, possibly with my character. "The Minister's Black Veil", "Roger Malvin's Burial", "Young Goodman Brown" - these are real works of art, coherent, purposeful. So why do I dislike them? The Amateur Reader knows enough to turn to the professionals for assistance. My intellectual flaw is something other than refusing to ask for help. If anyone wandering by would like to suggest a book or essay on Hawthorne or his stories it would be much appreciated. Let every man skin his own skunks. "A common fellow, a carpenter, who, on the strength of political partizanship, asked Bridge's assistance in cutting out great letters from play-bills &c, in order to print Martin Van Buren Forever, on a flag; - but Bridge refused. 'Let every man skin his own skunks,' says he." Nathaniel Hawthorne, The American Notebooks, Centenary edition p. 36. I have been keeping up a pretty good churn rate in the little "Currently Reading" box to the right. That's done for a while. Dickens, Hawthorne, Clare - none of those books are going anywhere for any time soon. The only one I'm reading with any speed is Nicholas Nickleby, and it's almost 900 pages. Neurotic Reader finishes his books. The wisdom of letting a book go unfinished is not one which he has yet acquired. Perhaps in his maturity. For now, though, I just keep chewing away. I'll have the Dickens done in two or three weeks. This makes it sound like a chore, when Nicholas Nickleby is, of course, a delight. Why would I want it to be shorter? * Or, much shorter - later, Dickens will have learned more about tightening up the narrative. Nicholas Nickleby was originally serialized, not in a magazine but on its own, like a comic book. You could go to the bookseller every month and buy the next installment. There were 2o sections, although I think the last one was a "double issue". So the contemporary reader who treated it like Harry Potter and read it the instant it was published read the book over the course of 18 months. War and Peace was published over the course of 4 or 5 years, In Search of Lost Time over 14 years, The History of the Decline and Fall of the Roman Empire over 12 years. Looked at that way, a month or two (or nine, for me, with the Gibbon) with a book does not seem so long. * Also, some of the business where Nicholas is with the theater troop could be cut. Not the part about the performing pony. Why so little love for the Germans? Should I spend more time explaining why the German Romantics – the German 19th century, really – has had such bad luck in the English-speaking literary world? Or wondering why, not explaining, since I don’t know the answer. There’s something strange about the tone of a lot of Romantic German fiction, something I do not know how to describe well. Sometimes it’s a sort of gentleness or serenity, even amidst the strangest events. I’m thinking of Adalbert Stifter here, or Goethe’s Elective Affinities, or some of Hoffmann’s fantasias. They all take place in a version of the real world that has been shifted, so that everything is just a little off. We are used to this in fantasy and horror stories, but in realistic stories many readers don’t know what to do. That’s a guess. A few German Romantics are really difficult to understand. The poets Novalis and Hölderlin, for example, or part 2 of Faust. Strangely, these really hard works are often as easy to find in English as more straightforward books by Storm or Keller or many others. None of this explains the case of Fontane, who writes in a similar style to Flaubert and Turgenev. Effi Briest ought to be as well-known as Madame Bovary. Or how about Heinrich von Kleist, hard to take, but very much a modern writer. I may be wrong. Penguin Classics keeps a number of these writers in print, which means that someone, somewhere is teaching them. Fontane, Hoffmann, Mörike, just recently a selection of Heine’s prose. Keeping up the good fight. Compare the status (in America) of 19th century German literature with that of Russian literature. With some trepidation, I’m joining an internet reading challenge for Russian literature. Everyone want to use it as a goad to start or finish War and Peace, The Brothers Karamazov, that sort of thing. In a German challenge, the focus would be very different – some Goethe, sure, but more Mann, Musil, and Grass, not so much Green Henry or Wilhelm Meister. Marcel Brion’s Schumann and the Romantic Age (1956) is mostly about Robert Schumann, his life and work. The book is well written, and Schumann’s life makes for a first-rate story – his fight to marry Clara, the madness that destroyed him, his continual creative struggle. But then there’s the Romantic Age, meaning the world of Liszt and Chopin, but also Romantic literature – German literature. This book about music is also an essay on a body of work that is unfortunately obscure and difficult to access. The first chapter is basically about Schumann’s early reading – Hoffmann, Tieck, Goethe, and huge quantities of Jean Paul. A later chapter gives us a quick history of lieder, where the ties to German poetry are obvious. For some reason, this group of writers has never quite found favor in England or America. As a result, translations are rare or non-existent, even of some major works. Brion, discussing Schumann’s one opera (Genoveva, never performed anymore), says that he had to choose between two different treatments of the saint’s life, one by Ludwig Tieck and the other by Friedrich Hebbel, one gentle, the other tragic. Both sound very interesting. Good luck to the reader without German. What is frustrating is that the stories and poems I have been able to track down are inevitably interesting, and often brilliant. Tieck’s story Blonde Eckbert is a dream-like masterpiece. Adelbert von Chamisso’s Peter Schlemihl, about a man who sells his shadow, and Friedrich de la Motte Fouqué’s Undine, about the perils of marrying a water spirit, are almost as good. Then there’s Schumann’s favorite, Jean Paul, Laurence Sterne’s great disciple. There are exceptions – Goethe, Kleist, Grimms’ Fairy Tales, even as difficult a writer as Hölderlin are fairly easily available. But why is it so hard to find a translation of E.T.A. Hoffmann’s “The Nutcracker and the Mouse King”, an enormously famous story thanks to Tchaikovsky? Why has his great novel The Devil’s Elixir been out of print since the 1960s? These writers have had their champions – Carlyle, Poe, Ford Madox Ford. They translated, they advocated, they became frustrated, in the last regard much like me. The end of Poe week - "The City in the Sea"
I didn’t mean to make this Poe week. Let’s finish it up. The wave - there is a movement there! Just a work of imagination, beautiful for its own sake, if you like this sort of thing. “The viol, the violet, and the vine.” Strange and original. Why does Death live in an underwater city? How can the graves be level with the waves? What is going on at the end – some hint of apocalypse? The poem is full of suggestive images and ideas, all suggesting something greater, whether it is actually there or not. One definition of the sublime. This is from a positive review! I wish I had more of these excerpts handy. Except when he is correcting the writer’s grammar, Poe is pretty good. He was intentionally creating the modern book review, focused on the actual book, not the political party of the author or some theoretical aesthetic stance. There’s a good passage in Lost Illusions about the old system, in Paris, at least, where Lucien writes (anonymously) influential good and bad reviews of the same book, without having read it. Poe - actually pretty good - "The Fall of the House of Usher"
Poe was first able to match his voice and subject in The Narrative of Arthur Gordon Pym by parodying real accounts of survival and adventure. His next insight, or accidental discovery, was that it was the nature of the subject that really mattered – it was the horrifying, unbelievable story that was well matched to his style. “The Fall of the House of Usher” (1839) is where this discovery takes place, the earliest of his 8 or 9 most famous stories. Our nervous, stiff narrator visits his nervous, hysterical childhood friend, Roderick Usher, at his isolated Scottish mansion. Terrible things are suggested, terrible things occur. The narrator escapes to tell us about them. That’s the story, really. Poe’s stories have been so thoroughly ransacked by movies and horror stories that a modern reader may not find the results so shocking. I think it’s still effective, despite that, and sometimes despite Poe. This is a long way from what I consider good writing, but there is some psychological effectiveness. Who would talk about being frightened in this way? What horrible trauma must this man have suffered to tell the story like this? What is he repressing? Some of this is ridiculous, too ("orb of the satellite"="moon"). But a lot of it is quite good, tense and effective (“deep and dark”, “sullenly and silently”). Whatever has destroyed the House of Usher has also damaged the mind of the narrator. Why was it so difficult for Poe to find the right subject for his style? Why was his voice so fixed? Most – all? – great writers face the same problem, although many of them seem to work out the voice/subject synthesis simultaneously. The subject shapes the style, and vice versa, and by the time the reader sees the book the fit already seems natural, even obvious. With Poe’s history of publication, we can see the style develop in the service of nonsense and trivia, and then, surprisingly, find a home. By 1838, Poe had been writing for 10 years without much success. He had developed a style that was convoluted, fussy, pedantic, and sometimes irritating. It turned out to work well in book reviews. Not in the short stories he had been writing, though. Poe had tried all sorts of stories, including a surprising number of comic stories. Period pieces, almost all of them. The style Poe had developed was not suited to the material he was using. But with the story “MS Found in a Bottle”, and then The Narrative of Arthur Gordon Pym, Poe figured out or stumbled upon a type of story that suited his voice. “MS Found in a Bottle” is the story of a shipwreck victim who finds himself on a ghost ship heading towards the Antarctic. Arthur Gordon Pym reworks the same material, with a mutiny, a plague ship, cannibalism, an undiscovered Antarctic island filled with savages and ancient secrets. Both are first person accounts, the narrator reporting on the strange things he encountered. Both break off at the same point, just as something really bizarre and mysterious happens. In retrospect, this is the beginning of horror fiction. But Poe found his way into this sort of story by parodying another genre, the “true story” of survival and exploration. Pym owes a lot, for example, to the account of the 1,000 mile boat journey, with almost no food or water, of Captain Bligh and his crew after the Bounty mutiny, and to the similar boat trip of Owen Chase after an enraged whale sank his ship. Probably also to plenty of other accounts I don’t know. Add to this the accounts of exploration. Since Pym ends up in the Antarctic region, Captain Cook’s journey is specifically mentioned. Poe borrows some subject matter and details from these books. But his real innovation was to borrow the voice. Horrible things happen to Chase and Bligh, but the accounts they wrote are very cool-headed. They can be emotional – sentimental or discouraged, for example - at certain points, but mostly they are professional. Captain Cook writes in the same way. So does Mungo Park, wandering around West Africa. There are two things gong on here. First, the authors tell us so many things that are hard to believe that they have to adopt a tone that reinforces their trustworthiness. Second, these are the stories of the survivors. They made it home, so they can afford to just give us their version of the facts. If the people who did not make it home told us their story, they might not be so calm. So Pym, who experiences all sorts of really horrible things, relates them to us in this detached, prolix manner - that’s how we get the scientific description of penguins nests, a chapter or two after he eats one of his fellow shipwreck survivors. But in this case, the events are so incredible that the cool manner of describing them actually increases the sense of horror. You wonder if the narrator is traumatized, or insane. How can he be so calm? This destabilization is made worse by parts of the story that otherwise make no sense. Pym is hiding in the stowage of the ship, at risk of dying of thirst and the fumes, when he has a dream that he is in the Sahara, where he is attacked by a lion. He awakens to find his Newfoundland dog licking him. There is no reason his dog should be on the ship, and the explanation given later is preposterous. Read a certain way, this is incompetent storytelling. If we are allowed to doubt the narrator, it’s something else. Poe had a bad ear for prose and a fussy voice that he did not know how to change. With Arthur Gordon Pym, he for the first time was able to adapt the material to the voice. It's his first great success, badly written in some ways, a strange triumph in others. "There can be no doubt, either, that the same result would ensue in the case of tobacco, while undergoing its usual course of fermentation, were it not for the interstices consequent upon the rotundity of the hogsheads." The Narrative of Arthur Gordon Pym, Chapter 6. "At each intersection of these paths the nest of an albatross is constructed, and a penguin's nest in the centre of each square - thus every penguin is surrounded by four albatrosses, and each albatross by a like number of penguins." Ch. 14. There's about three pages describing birds. This is part of an interlude in the book where nothing happens. I could put up dozens more awkward or silly sentences, but I'll stop. This is actually a good novel, but easy to ridicule. Before Arthur Gordon Pym, Poe had been writing for about 10 years - poems, short stories, and book reviews. I don't think he had much to show for it. One decent story out of dozens ("MS Found in a Bottle", recycled in Pym), a few good poems (one great one, "The City in the Sea"), and a budding career as the most notorious book reviewer in America, the Tomahawk Man. Rereading Arthur Gordon Pym, I now think this is where Poe really comes into his own as a writer. Tomorrow I'll see if I can show how he does it. He does see an elephant. 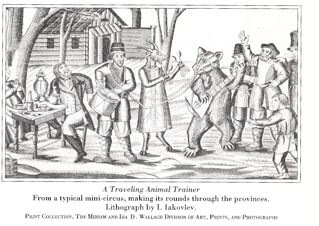 Retuning from the fair to Moscow, his coach moving at the typical Russian speed (as fast as the whip can make the horses go), he comes across, just on the highway in the middle of nowhere, a fully decorated Indian elephant, accompanied by a sort of caravan with camels, horses, and their riders. Custine's horses are spooked and he's nearly killed. The elephant turns out to be a gift from the Shah of Persia, on its way to St. Petersburg. How much time must the whole trip, walking the elephant from Persia to the Baltic, have taken? 6 months? How much did it cost. This trip would be a good subject for a short story, about the Iranian elephant keeper and his trip to St. Petersburg. Or it could be a 500 page novel from the point of view of the elephant. Whatever. Jones Very (1813-1880) wrote around 900 poems. Emerson published about 70 of them, along with three literary essays, in 1839, in Essays and Poems. The rest of the poems were published in 1880, by Very's friends, in a book helpfully, or confusingly, called Poems and Essays. So I've read the poems in the 1839 book. I posted one yesterday. I want to read more of his poems, but I need a Selected Poems, to which I don't have access. 900 is too many. Almost all religious poems, too. In 1838, age 26, Very discovered that he was the Second Coming of Christ. He spent a few months in a mental institution, but since he was lucid and peaceful, he did not have to stay there. For a while, he wandered around New England, visiting his Transcendentalist friends, failing to convert any disciples to himself. Then he became a recluse, for almost 40 years. The whole time, he wrote poems, poems, poems. Almost all religious, even the nature poems, even the political poems. Leafing through the 900, here are some titles: "On the Nebraska Bill", "The Congress of Peace at Brussels", "Do Nations ever become Insane?" Help. He lived long enough to go from "The First Telegraphic Message" to "The Telephone" . I've grazed a little, enough to know that there's a lot to like here. "Keep me from evil, that it may not grieve." When we cannot the sufferers relieve! Nor power their wrongs and miseries to heal. To grieve his heart, or rankle in his mind.